I adopted Bisquit in 2012. Bisquit was a young unbroken filly, who had been rescued from a starvation impound. From the first time I met her… I felt the connection. Even though there were no words exchanged, I could feel that she just understood me… and my life’s story. Despite being a novice rider and having never trained a horse before, I knew she was the horse for me. Shortly after adopting her I started taking lessons and became more confident in my horsemanship skills. But it was during our long walks to the mailbox and sunset “rides” (just sitting on her back) we learned how to speak each other’s language and trust one another. Both of us had scarred hearts, and with each other’s support our hearts have healed. 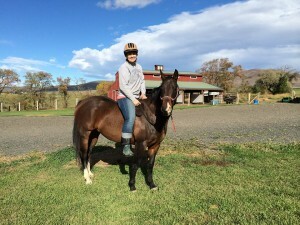 This sweet, sassy mare has been there for me in thick and thin… she watched me get married, start a career, and struggle through the ups and downs of life. Through it all, she continued to remind me to keep everything in perspective and see the good in life.